Every year there’s a massive convention of the bicycle industry—Interbike. Interbike has been around for 36 years. A long-time mainstay in the city of Las Vegas, Nevada, the show moved upstate to Reno for 2018, and it was more e-bike-focused than ever. From bikes to e-specific tires and other accessories, there was something e-bike-related in nearly every booth. In fact, it seems that there aren’t but a handful of companies left still holding out on e-bikes. Sergeant Matt Bygum was one of the speakers from the LAPD talking about how e-bikes have already impacted their bicycle patrols. There are presentations at every hour of every day—from seminars to discussions on topics from how to increase social media presence to training on best practices in the bike shop. The LAPD was there on Bosch’s stage, talking about how their e-bike program has already increased arrests by 140 percent and dropped response times in the areas where they are deployed. In one seminar, we learned that e-bike growth in the U.S. has been 66 percent year over year, and that one major bike company found out that though e-bikes were 11 percent of their sales in units, it accounted for 50 percent of their total sales. There’s so much great information, it alone is worth coming to the show! Closeup of the interface for the motor and battery, both of which come out of the bottom of the downtube. The precursor to the indoor expo is the Outdoor Demo held in nearby Lake Tahoe at the Northstar Resort. This is where people can ride demo bikes from many different manufacturers. This is also where many dealers come to find the brands they might carry. It’s mountain bike-heavy, but there are all kinds of bikes there—from road to folding to some really unusual bikes. Northstar is a popular ski area in the winter, but they have outstanding trails for mountain biking. Bulls’ distributor is bringing over lower-priced sister brand Pegasus starting in 2019. Whereas there was a nearly hour-long wait at the lift, with e-bikes it was a 10-minute ride to mid-mountain! It’s such a blast, and we had the chance to ride many new bikes we hadn’t yet ridden. Sometimes this job just doesn’t seem like work. This is the first time we saw the Bianchi Aria E-Road in the flesh. Unfortunately, it wasn’t available for riding during the show. We’re curious to do a full review on it or the Orbea. Both feature the Ebikemotion X35 hub motor. Stromer’s new ST1. This is the first-ever e-bike prototype we’ve ever seen that was 3D printed! We were the first allowed to ride the new Fantic with the Fazua motor. It didn’t offer any resistance above 20 mph, was very light for an e-bike, and it may be a game-changer. Riese & Müller had their cadre of overbuilt, cool-looking machines. This belt-driven cargo bike is pre-configured with a handle for a passenger to hold on to, built-in Abus lock holder and a Bosch Performance Line motor. This year the demo track was outdoors, offering much more space and a better track. SR Suntour has expanded their line of e-specific forks. We should have some to test soon. Haibike had one of their new Flyon motor-powered bikes on display. This XDuro AllTrail 6.0 was kept behind glass. Not sure when they’ll have production models, but we’re champing at the bit to get at anything with 120 N/m of torque! Praxis has a full line of carbon eCranks, at $280, made for Yamaha, Bosch, Brose, Specialized and even Fazua, in a variety of lengths. iZIP’s Simi is one of their answers to the new Chinese tariffs. They’re building them in Thailand, and the Suntour drive system is from Vietnam. We had a chance to check out the guts and shell of the new Brose Mag-S motor. That motor casing is very light. iGo is making a serious push in 2019 with a slew of new models using an interesting variety of motors, from Bafang to Shimano. The Pivot Shuttle won our E-Bike of the Year Award. Yamaha launched the Wabash dual-purpose bike named after a famous gravel trail in the Midwest. Abus showed off their newest e-specific helmet, with built-in lighting and a pop-out rain cover. It’s made specifically for Class 3 bikes, offering more impact protection than a regular bike helmet. Abus also had several new locks, including this new smart lock, the 770A SmartX lock. It is Bluetooth-connected and has an alarm. It’s keyless, so you can walk up to it and it has a proximity sensor, unlocking it when you walk up. Our pick for E-Bike Innovation of the Year? Bosch’s PowerTube battery. Every year at Interbike, awards for the best products in the industry are selected. 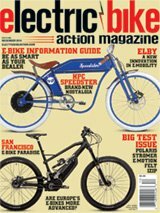 Electric Bike Action, along with sister publications Road Bike Action and Mountain Bike Action, is tasked with selecting the best of the best in several categories. EBA picks two—the best e-bike and the best e-bike product. By August, we have to receive anything from any company (who must also be registered with a booth at Interbike) that sells e-bikes or products that wants to submit it for consideration. We were flooded with entries at t. Our warehouse overflowed with so much good stuff! It was a lot of work, but a lot of fun to try everything out. In print, from the Apple newsstand, or on your Android device, from Google. © 2019 - Electric Bike Action. All Rights Reserved.